On May 21, 1927 the Carquinez Bridge opened to traffic between Crockett and Vallejo, California. Just a few miles north of San Francisco, the Carquinez Bridge was the longest highway bridge in the world when it opened. It was also the first bridge across any part of the San Francisco Bay. The reason you have never heard of this magnificent bridge is because its opening was upstaged by Charles Lindbergh's landing in Paris! For most of its working life the Carquinez Bridge lived in the shadow of its more famous siblings: the Oakland Bay Bridge and the mighty Golden Gate Bridge. Still, the Carquinez Bridge was an engineering triumph. Designed by the great engineer David Steinman, the mighty Carquinez was built using new construction techniques and was the first bridge to use earthquake buffers in the design. A second twin Bridge was opened in 1958 and third replacement bridge was opened in 2003. From 2005 through 2007 the old bridge was deconstructed in reverse order of its construction. 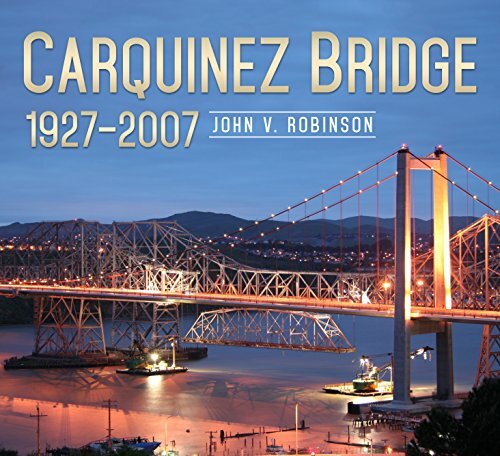 In this book John V. Robinson takes readers on a photographic journey through time as he documents the birth, life, and death of one of America's great bridges. JOHN V. ROBINSON is an award-winning photographer and writer who is the author of seven previous books, including: Spanning the Strait: Building the Alfred Zampa Memorial Bridge (2004), Bridging the Tacoma Narrows (2007), and Bay Area Iron Master Al Zampa (2015). He holds degrees from UC Berkeley and San Francisco State University. In 2006 Robinson was awarded a Guggenheim Fellowship in the field of Folklore and Popular Culture. In 2007 he was a California Council for the Humanities recipient in documentary photography. John Robinson teaches English at Las Positas College and at California State University--East Bay in Hayward, California.